13-Jul-2008 -- This is the fourth out of 23 confluences that I visited on my bicycle trip to the North-East of China. The story starts from 40°N 117°E. Coming from 40°N 119°E I spent the night in Jiànchāng (建昌), a city located 40 km (26 km beeline) south-west of this confluence point. On the following day, I planned to visit this confluence, but I got sick. Bad diarrhea kept me from moving on and I had to stay in town all day. One day later, I felt a little better and decided to move on. I got up at 4:00 am and started cycling at 4:30 am. The breakfast buffet would begin 3 hours later – I couldn’t wait for that and had some cereal in my hotel room instead (the little breakfast stands on the street would serve food only from 6 am). I left the main road at Shíèrdébǎo (十二德堡乡), which is 7 km beeline from the confluence. But even on the back road I could enjoy a freshly asphalted road up to 2.2 km beeline distance. Then, I had to leave this road again and tried to find some tracks. Without a proper map of the area (only 1:2 Mio), I had some difficulty to come close to the confluence by bike. Several times I ended in dead ends and had to return. Finally, I found a track that was leading over a pass towards Gǔzhàngzǐ (谷杖子). To my delight, the track came as close as 230 m to the confluence. I hid my bicycle in a corn field and started a walk between two corn fields. At these morning hours, the leaves had still their morning dew on them and with the time, I was soaking wet. To my surprise, I crossed another track at a distance of 80 m. So my difficult and watering walk turned out to be unnecessary. I climbed some corn field terraces and located the confluence at the edge of one of them. On my way back, I met a farmer. I asked whether he would pose for the confluence website. He was a little shy first, but then agreed, taking off his cap to the picture. I was lucky, that the track continued towards the west. It serpentined down a mountain pass. After two hours of cycling on this track, I reached the main road towards the city of Cháoyáng (朝阳). I stayed on this road (unfortunately under construction) for another 100 km and spent the night in Cháoyáng. Time starting the hike: 7:29 a.m.
Time at the CP: 7:52 a.m.
Topography: mountainous, on a terraced slope. Description of the CP: In south-western Liaoning Province. At the very edge of cultivated farming area. On a terraced corn field. Half way up a valley. 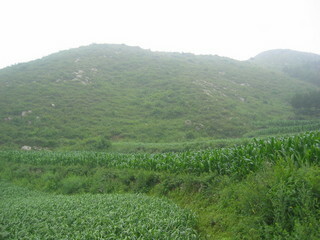 Above, uncultivated mountain land. Story continues at 42°N 120°E.